What is Exhaust Gas Recirculation (EGR)? Diesel engines tend to emit higher Nitrogen Oxide (NOx) which is harmful to humans. This is because of high temperatures in the engine cylinders because of higher compression ratio. To control and decrease the NOx, manufacturers employ 'Exhaust Gas Recirculation' technology in engines. The term EGR stands for Exhaust Gas Recirculation. It is a part of modern-day diesel engine vehicles which helps to decrease the Nitrogen Oxide (NOx) emissions. Exhaust Gas Recirculation is the technique used for reducing the nitrogen oxide in both the internal combustion diesel engines as well as petrol engines. The Exhaust Gas Recirculation system recirculates a part of the exhaust gas back into the engine cylinders through the combustion chamber. The logic behind the EGR system is very simple. The exhaust gas is hotter than the fresh air sucked by the engine. So, the exhaust gas significantly reduces the contents of the cylinder for combustion. Because of the absence of oxygen (O2), the exhaust gases have nothing to burn as they contain neither fuel nor oxygen particles. Thus, it results in lower heat discharge and cylinder temperatures. It reduces the formation of nitrogen oxide (NO2) as well. The dormant exhaust gas present in the cylinder also limits the peak temperatures. It also reduces the loss that arises because of throttling in petrol engines while improving the engine life by reducing the cylinder temperatures. The three-stage catalytic converter further reduces the NOx to acceptable levels. A vacuum controlled EGR valve regulates the amount of exhaust gases admitted into the cylinders. It consists of a spring-loaded vacuum diaphragm. It links to a metered valve which controls the passage of the exhaust gases. Ported vacuum from a calibrated signal port located above the throttle valve connects to the EGR vacuum chamber. At idling, the EGR valve is in the closed position because of the spring pressure and lower ported vacuum. The engineers designed it so because if the exhaust gases recirculate at the idling, then it would cause rough/erratic idling. Upon opening of the throttle applies the ported vacuum and gradually opens the tapered valve. This causes the exhaust gas to flow into the intake manifold. However, when the throttle opens fully, there is no vacuum in the intake manifold. So, it closes the tapered valve and stops the exhaust gases from entering the intake manifold. The engineers designed the EGR system in such a way that it recirculates the exhaust gases only when the engine forms the Nitrogen Oxide (NOx). Thus, the EGR system DOES NOT affect the ‘Full-Load’ operation. The Exhaust Gas Recirculation system also has a thermal control valve in the vacuum line which prevents the operation of EGR at lower engine temperatures. This system is useful especially in the diesel engines where the catalytic converter cannot stimulate the chemical reduction due to high oxygen contents. So, the NOx emission remains the same in such conditions. The ‘Blow by’ is the collection of all the gases in the combustion chamber. Some of these gases leak past the piston rings into the crankcase area. Thus, the ‘Blow by’ gases causes contamination of the engine oil which depends upon the color of the gas. It also affects the viscosity of the engine oil. Due to the wear and tear of the piston rings and cylinders, the air-fuel mixture and the burned gases from the combustion chambers leak past the piston rings into the crankcase. This seepage of gases from the rings or the cylinders is called 'Blow-by'. It generally appears as contamination or dilution of engine oil. You must maintain the engine in order to get the best efficiency and fuel economy and optimum performance from the engine. If the ‘Blow-by’ gas leaks and slips past the rings, the piston does not get pushed down as effectively as needed. Hence, it can result in a loss of horsepower being generated. Read On: How Diesel Particulate Filter (DPF) works? 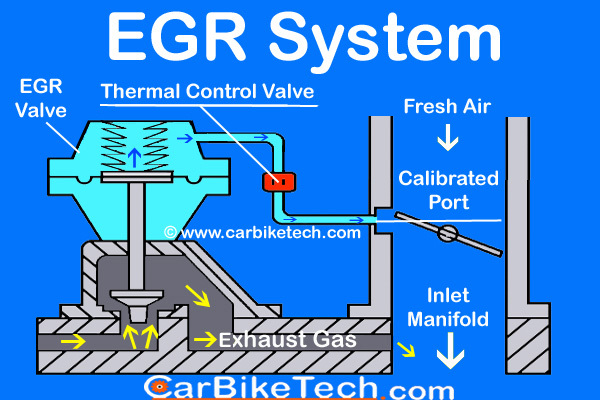 Home » Technical Anatomy » What Is Exhaust Gas Recirculation (EGR) & How It Works? Diesel Engine: How A 4 Stroke Diesel Engine OR Compression Ignition Cycle Works? What is Cross-wind? How Crosswind Assist Works? What is Front Engine Layout And Know How is it beneficial? E-Diesel = Water + Air? It’s True, Know More.